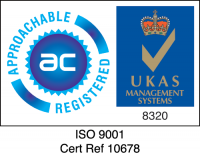 2D Engineering Ltd Quality Policy & response to the requirements of its BSEN ISO 9001 registration is documented in manual form issued to its customers on a request and acknowledgement basis. This top tier manual is supported by detailed quality procedures. All customer contracts are reviewed for their completeness and the ability of 2D Engineering Ltd to meet all requirements. Procedures exist to ensure that all specifications, drawings and control documents are maintained at current issue status and that obsolete items are removed promptly from the point of use. Only those suppliers listed int he Authorised Supplier List, controlled by the Administration Department are used for the procurement of raw materials and process assistance, which may have an effect on product quality. All product batches are traceable throughtout manufacture and release by the use of unique batch numbering systems. Where required, traceability of incoming materials can be demonstrated by the use of Material Cast Marks. Inspection & testing in accordance with documented procedures is carried out to ensure the quality of supplied goods, in process quality and the quality of finished items prior to despatch. All measuring, test and process control equipment is maintained in a state of known calibration using control devices traceable to national standards. Inspection status is apparent at all times by the use of quality signatures and conformance labels. All non-conformances over an agreed level is segregated, quarantined and investigated. All investigations are documented and any resultant corrective actions are monitored for effectiveness. All products supplied by 2D Engineering Ltd are handled in a manner which ensures product quality, by the use of dedicated equipment, packing and controlled storage conditions. Records that demonstrate the achievement or specification of quality levels are maintained for a minimum of five years unless otherwise agreed with customers. The quality system is subject to internal audit according to a planned timetable and an annual management review to ensure its continuing effectiveness. Regular review of the training and development needs of all employees are carried out, documented and implemented. For those items stocked and supplied outside our QA system. For in house manufactured and inspected items. 2D Engineering Ltd Quality System was designed, implemented and currently managed by Quality Services in Maidstone.